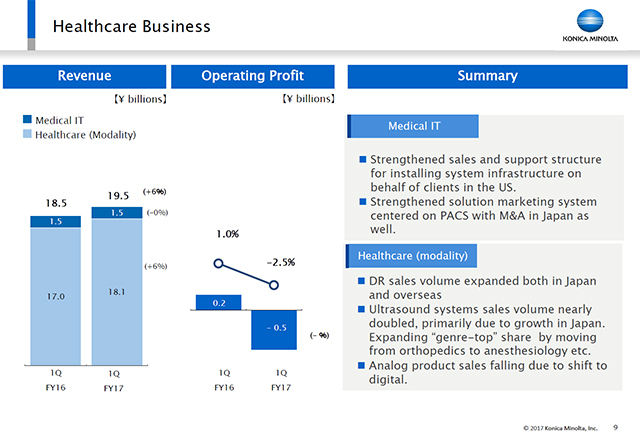 The first point to note about Healthcare, which handles diagnostic imaging products, is that sales volumes of DR and diagnostic ultrasound systems rose, leading to higher revenue. However, the competitive environment for DR is challenging. Falling average selling prices, together with the failure of increasing sales of digital products to fully offset the decline in analogue products, resulted in an operating loss being posted in the first quarter. In the second quarter we expect to see the results of a marketing alliance that we are working on with a major partner company, leading to a further increase in DR sales and a sharp recovery in profitability. Ultrasound systems are a "genre-top" product in the field of orthopedics in Japan, but as well as expansion into other diagnostic areas, such as anesthesiology, overseas markets such as the US and China are also growing. In the medical IT business unit, in the US we strengthened the sales structure at the Viztek business that we acquired, as well as in our own client support structure for system implementation. In Japan, by adding Panasonic Medical Solutions Co., Ltd to the Group we put in place a foundation to strengthen the solutions business, primarily in the area of PACS.